Genergraphics® allows an advertiser to "get into" the mindset of consumers according to their generation. Simply stated, it lets an advertiser market the same product or service to different generations at the same time (without alienating any one generation), by appealing to their mindset. This can be done because when you understand the mindset of a generation, then you can appeal to the reason they may want to purchase your service or product. Genergraphics is all about acquiring new customers while retaining existing ones. It will hit the "hot buttons" of a generation, resulting in increased sales for the client. 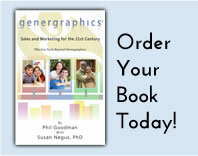 The Genergraphics method allows the advertiser to accurately track people by their generation. This will save a lot of the dollars that are currently being wasted in advertising where the focus is on an age group (Demographics) rather than a generation (Genergraphics). Genergraphics can show an advertiser the influence one generation may or may not have on another generation. A couple from the Baby Boomer generation is house hunting. Joining them are their 2 elementary age children and a mother-in-law, who may come to live with them. While the agent is showing them the home, the couple is looking to each of the family members for a reaction whether it is good, bad or indifferent. While the couple care and want to please each other and love their mother-in-law, the ultimate decision, most of the time, will come down to the children. While the school district and school location is important, seeing a positive reaction from their children toward the home will become the biggest influence (aside from price and features) on whether or not they will purchase it. Baby Boomers are more influenced by their children than their senior parents or each other in major purchasing decisions. Genergraphics will show this.